There is some evidence to suggest that saline nasal irrigation may modestly improve some seasonal allergy symptoms. The available data on efficacy of saline nasal irrigation for seasonal allergy symptoms consist of several randomized controlled trials in both adults and children, as well as a systematic review and meta-analysis. A 2012 systematic review and meta-analysis of 10 studies found that saline nasal irrigation administered regularly over a period of up to 7 weeks was observed to have a beneficial effect on nasal symptoms, reduction in medicine consumption, acceleration of mucociliary clearance time, and quality of life in adults and children with allergic rhinitis. A 2012 review of nasal saline irrigation in the management of sinonasal disease found that nasal saline irrigation appears to demonstrate some modest clinical benefits. Most important is the source of water that is used with nasal rinsing devices. According to the U.S. Food and Drug Administration, tap water that is not filtered, treated, or processed in specific ways is not safe for use as a nasal rinse. Some tap water contains low levels of bacteria and protozoa, including amoebas, which can stay alive in nasal passages and cause potentially serious or fatal infections. There is some evidence that butterbur extract can decrease the symptoms associated with seasonal allergies. The available data on efficacy of butterbur for seasonal allergies consist of only a few rigorous randomized controlled trials. Findings from a 2007 systematic review of six randomized controlled trials suggest that butterbur is superior to placebo or similarly effective compared with nonsedative antihistamines for intermittent allergic rhinitis. However, firm conclusions could not be drawn because three of the large trials reviewed received financial support from a manufacturer of butterbur, which represents a conflict of interest. A 2003 review of several modalities used to treat ocular allergies found that in one study of 125 participants, butterbur was just as effective as a commonly used oral antihistamine for itchy eyes. Raw extracts of this herb contain toxic pyrrolizidine alkaloids, which can cause liver damage and cancer. Extracts of butterbur have been prepared that are almost completely free from these alkaloids. However, no long-term studies of butterbur products have been conducted, including the reduced-alkaloid products, so its long-term safety is unknown. There is no convincing scientific evidence that honey relieves seasonal allergies. The available data on efficacy of honey for seasonal allergy symptoms consist of only a few randomized controlled trials. A 2011 randomized controlled pilot study of 44 patients with physician-diagnosed birch pollen allergy found that patients who used pre-seasonal birch pollen honey had significantly better control of their symptoms compared to those on conventional allergy medication, and they had marginally better control of their symptoms compared to those using regular honey. However, these results should be regarded as preliminary. Eating honey is generally safe; however, children under 1 year of age should not eat honey due to the potential risk of contracting Clostridium botulinum. People who are allergic to pollen may also be allergic to honey. A 2015 review concluded that there are high-quality randomized controlled trials that demonstrate efficacy for acupuncture in the treatment of both seasonal and perennial allergic rhinitis; smaller studies show some preliminary benefit of acupuncture when compared with antihistamines, but these had some methodological limitations. Relatively few complications from the use of acupuncture have been reported. Still, complications have resulted from inadequate sterilization of needles and from improper delivery of treatments. A 2015 systematic review and meta-analysis examined the safety and efficacy of acupuncture for allergic rhinitis and concluded that the meta-analysis suggests that acupuncture could be a safe and valid treatment option for patients with allergic rhinitis. There is some limited evidence that suggests that probiotics may improve some symptoms, as well as quality of life, in patients with allergic rhinitis, but overall the data on probiotics and allergic rhinitis is inconsistent and effects may vary from one probiotic formulation to another. The available data on efficacy of probiotics for allergic rhinitis consist of several systematic reviews and meta-analyses of small randomized controlled trials with a high degree of heterogeneity. A 2015 systematic review of 11 randomized controlled trials concluded that current evidence is not sufficiently strong to verify a preventive role of probiotics in allergic rhinitis, but probiotics may improve the overall quality of life and nasal symptom scores. Because available data are only from a small number of studies with a high degree of heterogeneity, routine use of probiotics for prevention and treatment of allergic rhinitis cannot be recommended. A 2015 systematic review and meta-analysis of 23 studies involving a total of 1,919 patients concluded that probiotics may be beneficial in improving symptoms and quality of life in patients with allergic rhinitis; however, current available evidence is limited due to study heterogeneity and variable outcome measures. A 2016 review of probiotics for allergy prevention concluded that to date, expert bodies do not generally recommend probiotics for allergy prevention; however, the review notes that World Allergy Organization guidelines suggest considering using probiotics in pregnant women, during breastfeeding and/or for the infant if at high risk of developing allergic disease. 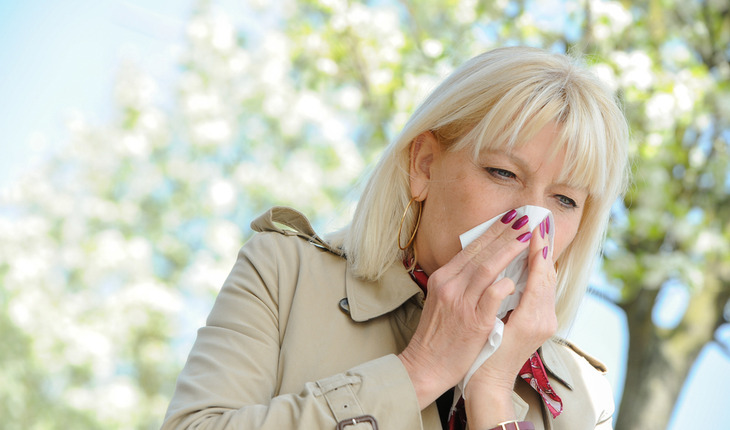 A 2013 randomized controlled trial of 60 patients with allergic rhinitis examined the effects of probiotic consumption (Lactobacillus casei Shirota) on clinical and immunological parameters of seasonal allergic rhinitis in an out-of-season single nasal allergen challenge. Results of the study showed that daily oral supplementation with Lactobacillus casei Shirota modified some parameters of allergic inflammation at the nasal mucosa but there were no significant changes of clinical symptoms of seasonal allergic rhinitis. In healthy people, probiotics usually have only minor side effects, if any. However, in people with underlying health problems, serious complications such as infections have occasionally been reported. The National Center for Complementary and Integrative Health is dedicated to exploring complementary health products and practices in the context of rigorous science, training complementary health researchers, and disseminating authoritative information to the public and professionals. For additional information, call NCCIH’s Clearinghouse toll-free at 1-888-644-6226, or visit the NCCIH Web site at nccih.nih.gov. NCCIH is 1 of 27 institutes and centers at the National Institutes of Health, the Federal focal point for medical research in the United States.